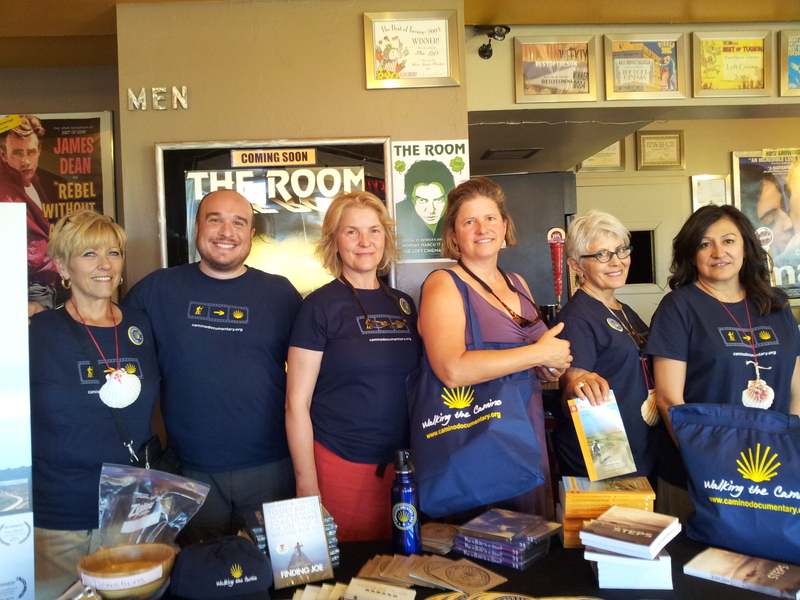 I and the other Coordinators along with a Member of The Old Pueblo Chapter of APOC worked with the Camino Documentary outreach team to bring and publicize the premiere of “Walking the Camino: Six Ways to Santiago” to Tucson, Arizona. Kathy, Malvina, Sue and I worked diligently distributing flyers to what seemed like all the local businesses in the city. We organized and sent out invitations to Chapter members to attend a Happy Hour on the patio of the Loft Cinema prior to the 6 pm premiere of the film. It turned out the patio was packed with members and their friends. The Premiere day arrived and the four of us were at the theatre by 2 pm to receive our assignments from the Director and her assistant. I was assigned to passing out clipboards throughout the theatre for people to sign up for Documentary updates as well as to assist Scott with the sale of documentary related items. Kathy would be passing out clipboards on the other side of the theatre. Malvina and Sue would be distributing flyers at the exits of the theatres once the film had ended. The sales table was especially busy with sales so that all of us ended up assisting Scott after the 6 pm showing. Lydia B. Smith, the Producer/Director of the documentary conducted a Q&A after both premiere showings. She spoke highly of the Old Pueblo Chapter of American Pilgrims on the Camino, and thanks to her and the documentary the Chapter has several new members. Lydia also arranged with the Manager of the Loft Cinema for Kathy and I to perform a Scallop Shell Ceremony on stage for two members who are leaving for the Camino shortly. Member Brett Martin, Chi Alpha Campus Pastor at the University of Arizona, read the Pilgrim’s Blessing at the ceremony. The documentary “Walking the Camino: Six Ways to Santiago” embarks on a journey with six strangers from around the world as they attempt to cross an entire country on foot – with only a backpack, a pair of boots and an open mind. Driven by an inexplicable calling and a grand sense of adventure, each pilgrim throws themselves heart-and-soul into their physical trek to Santiago and, most importantly, their personal journey to themselves. If you get a chance to see this Documentary, please do. It just may help you understand this uncontrollable “desire and need” I have to return to the Camino time after time. This entry was posted in Adventures, Camino de Santiago, Old Pueblo Chapter of APOC and tagged camino de santiago, Camino Documentary, Old Pueblo Chapter of APOC, The Loft Cinema. Bookmark the permalink. Thanks Arlene – working on it!! It would truly be my pleasure to help promote the film. I’ve been watching for this to come to the Vancouver area! Ha! I’ve just checked and found that it is now playing in Bellingham, WA, less than an hour away (depending on the border delays). I am half considering going tomorrow! I am just now seeing the light at the end of the tunnel after my mother’s death and all the work before and after. This would be a really nice diversion. I hope you do decide to see the film! It is wonderful and I am sure you will enjoy it. Take care! Saw it in San Diego last week. Great film and re-energized my interest in the Camino. For me viewing the film felt like going home. Oh how I love the Camino and in a few short weeks my feet will be back on the Way! 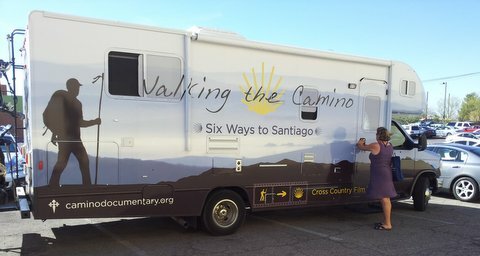 Congratulations on bringing to Tucson the wonderful documentary “Walking the Camino – Six Ways to Santiago” and for the successful premiere screenings. We’re all hoping here in Australia that it will be screened here in the not too distant future or that it will be available on DVD at some stage soon. Best wishes with your training … not long now until you leave. It was great, I too hope she is able to get it out there internationally! I will be purchasing the DVD when it becomes available. I would be happy to send you one at that time should you not be able to get it. Cheers and thanks so much Arlene! Several of my friends from my pilgrim group are really keen to see it too, so this would be wonderful. PS – what day are you leaving the US for your Portugues Camino with Bill and co.? Jenny, I leave the States on April 4th. I will arrive in Porto on the 5th. The tour begins on the 7th so I will have time to become accustomed to the 9 hour jump ahead. Great Arlene! Thanks for letting me know. I want to make a note of the date so I can wish you a really, really special Buen Camino! Dear Clare – my condolences on the loss of your dear Mum. I hope that you and your loved ones are managing OK at this sad time. A neighbour and friend who I have known all my life (I’m 58) said to me back in 2007 when my beloved Mum passed away – “there’s NO ONE like your Mum”. I often reflect on those words – Mums are so special. Thank you, Jenny. What you say is true, but we are more sentimental than sad. Going through Mom’s 91 years of diaries, photos and letters brought back the younger woman who we had forgotten in recent years. It brought back the younger “us” as well! Dear Britta, so very nice to hear from you. If the DVD is not out when you come to the States, I will be more than happy to pick up a copy for you also. I am so lucky and happy to be the founder of the Old Pueblo Chapter of APOC, it has brought me much pleasure since I began it. Actually, to be truthful, the Camino has given me a new life; it has opened my world up to so many new possibilities and friends. For example, I would not have you, Jenny, Bill, Steve, Clare, and many more as my friends had it not been for the Camino. Yes, the Camino gave me what I needed not necessarily what I was expecting to find. PS – I will be blogging my Camino Portugués so stay tuned! Hear Hear Britta! I second all your comments! I’m back now from seeing it. Just as one doesn’t want the camino to end, I didn’t really want the movie to end! Hi Arlene – your thoughts to Britta ring so very true with me – for me the Camino has been so embracing and so life enhancing. I too am finding so many new possibilities and friends such as yourself and other members of our PGS family and some very special people on Ivar’s Forum. I’ve really had my eyes opened – it’s wonderful. Jenny, I have met so many wonderful people because of the Camino it was one of the best experiences of my life!